BROOKLYN, N.Y. – Another MVP effort by junior Dedric Lawson gave the No. 2 Kansas Jayhawks a 87-81 win over No. 5 Tennessee in the championship game of the NIT Season Tip-Off Friday night inside Barclays Center. Lawson tallied 24 points and collected 13 rebounds en route to claiming tournament MVP honors. 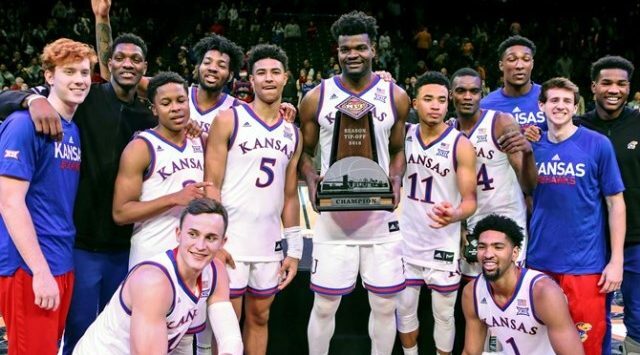 Lagerald Vick, who added 15 points, was also named to the all-tournament team as the Jayhawks claimed their fourth NIT title. Kansas moved to 5-0 on the year, while Tennessee suffered its first loss of the young season, going to 4-1. The first half began with at a brisk pace over the first three minutes of play and was a back-and-forth affair, with the Jayhawks and Volunteers having nearly identical numbers in every statistical category and the lead swinging in either direction by as few as five points. Leading by a just pair of points after 20 minutes, the Vols had committed six turnovers to KU’s nine, one statistic that was keeping the score close, as were the Jayhawks’ missed free throw opportunities, as they were only able to convert on 3-of-8 from the charity stripe for a 37.5 percentage. UT pulled down one more rebound than the Jayhawks, 20-19, and also led in blocks (3-1), steals (3-1) and assists (7-5). Kansas did manage to outshoot its opponent from the field by a percentage of 48 to UT’s 39, but with junior center Udoka Azubuike having played only eight minutes of the first 20 due to foul trouble, the Jayhawks headed to the locker room trailing for the second time this season, 31-33, to Tennessee. Two more quick fouls were called on Kansas’ 7-footer, Azubuike, in the first five minutes of the second stanza, sending him back to the bench as the Volunteers continued to out-execute Kansas on the offensive end of the court. The Volunteers built their largest lead of the game up to nine points, 45-38, prior to the first media timeout of the second half. As Tennessee went on a scoring drought of its own for more than three minutes, the Jayhawks started to play catch up, scoring five points in the span of less than 30 seconds with an Azubuike dunk and a Lagerald Vick 3-pointer, his second trey of the game, and first since the opening minutes of play. Vick’s second three in two trips down the court gave the Jayhawks their first lead of the second half at the 6:47 mark, 59-56. On the next offensive possession, the senior guard from Memphis, Tennessee, hit a long jumper, having then consecutively scored eight-straight points for Kansas. However, UT’s Grant Williams was the Volunteers’ answer to KU’s Vick, as the orange went on a 6-0 run, while simultaneously holding Kansas scoreless for 2:21. Azubuike picked up his fifth foul, having played only 17 overall minutes in the game, scoring nine points and pulling down four rebounds. The game’s lead continued to change hands as Vick had a hard drive to the bucket from the corner but Williams scored 10-straight points for the Volunteers. However, it was just a little more than a little later that Williams himself fouled out of the game with 1:24 to play, finishing with 18 points, eight rebounds and six assists. Senior guard Admiral Schofield hit his first 3-pointer of the night with 2:05 to go in the game after a rough night shooting, but took over for UT when Williams fouled out. Although he shot just 9-of-22 from the floor, and 2-for-8 behind the arc, Schofield ended the evening with 21 points, six rebounds and two assists. Although KU picked up its shooting in the second half, knocking in 52 percent of its shots, and the Kansas defense held Tennessee to 41 percent shooting, the grind-it-out game was a battle until the clock ran out and the teams headed to overtime with the score knotted at 69. Kansas found its three redshirts, who sat out the 2017-18 season together, seeing extended time on the floor tonight, and all contributed positively in Dedric Lawson; his brother, K.J. Lawson (eight points, six rebounds in 19 minutes); and Charlie Moore (nine points scored in 32 minutes played). Freshman guard Devon Dotson was lauded as “terrific throughout the game,” playing with an “energy never subsided.” He hit key free throws as the clock would down to help the Jayhawks seal the victory. In fact, Dotson scored a new career high tonight with 17 in 40 minutes played, also a new career best. In addition to Lawson and Dotson’s double-figure scoring performances, Vick continued to have the hot hand for the Jayhawks, as he collected 15 points in 43 minutes played, his fourth-straight contest in which he has scored in double-figures. Azubuike and Moore both chipped in nine while K.J. Lawson contributed eight and freshman guard Quentin Grimes rounded out the Jayhawks’ scoring with five points.